I hope that I am not too often shocked but, when this book arrived, it didn’t remotely fit through the letterbox and seemed to weigh a ton. My neighbour, who accepted it, asked if it was another cricket book. It is but is no ordinary cricket book. It is a mighty hefty book, the majority of pages adorned with predominantly rare photographs and is a most tremendous record of Australian cricket throughout its history. Edited by Christian Ryan, whose book, Golden Boy, on Kim Hughes, won Best Cricket Book at the 2010 British Sports Book Awards, this tome is far from being a photographic record of Australian cricket. There are essays from some of Australia’s finest writers – and not just Australians: Mike Brearley writes, as usual, a very erudite piece on Dennis Lillee – covering aspects such as scoring, the Australian drinking culture by teetotaller Geoff Lawson and groundsmen, amongst many other interesting articles. Sportsmen love to ask “what if such and such happened” and cricket is far from being an exception: Gideon Haigh asks in a thought-provoking article what might have happened had Monty Noble won the toss in a 1904 Test, and, amongst more well-known episodes, the consequences of Herschelle Gibbs dropping of Steve Waugh in the World Cup of 1999 and Steve Harmison’s lethal slower ball to bowl Michael Clarke from the last ball of the third day of the 2005 Edgbason Test. As always, Haigh’s is a fascinating article. There is an excellent Records section at the end of the book. Interestingly, the order in which the players appear is not alphabetical but sequential starting with Test cricket’s first centurion, Charles Bannerman, to the most recent ( at time of publication), Usman Khawaja ( number 419). Captains records are also given sequentially as are captaincy records against individual countries. There is also an excellent section on Sheffield Shield records. The cover photograph, for me, brings back fond memories of when my interest in cricket began. After watching the 1975 World Cup with Dennis Lillee and Jeff Thomson letting rip, the subsequent England and Australian Test series remains vividly in my memory and the cover photograph shows this smiling group, all with plenty of facial hair – indeed all with good heads of hair – and four with baggy green caps and all attired in no-frill whites. They looked as if they meant business. As a colleague and I agreed, real cricketers. There was something about the Australians of that era. I mentioned earlier about the rarity of the photos. Some will have been seen before, others possibly not: Doug Walters watching horseracing in front of a TV set, Brian Lara being dismissed by Zoe Goss, Allan Border taking guard with the scoreboard behind him offering a congratulatory message on the birth of his daughter Nicole, English born but Australian settled Harold Larwood in his van carrying Pepsi-Cola for whom he acted as traffic manager in Sydney and the vast pile of empty tinnies awaiting an SCG cleaner in 1969 after a day’s play at the SCG again amongst many, many others. 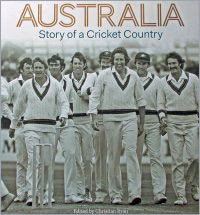 There have been other cricketing country histories written and indeed on Australia but this, for its wealth of diverse subjects, photo and articles, has to be one of the foremost books to be published on Australian cricket and is a must for any cricket fan.